Before explaining Tyrol's history, be aware that the mountain is on private property - please do not trespass, thanks! 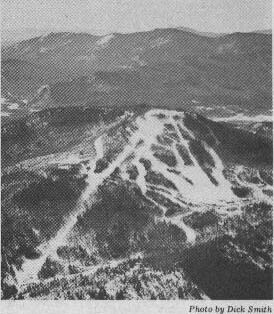 Our best information about this ski area comes from the following passage which is from Jim Clarke who wrote his Master's Thesis on the Economic and Social History of Skiing in New England, 1920-1980. 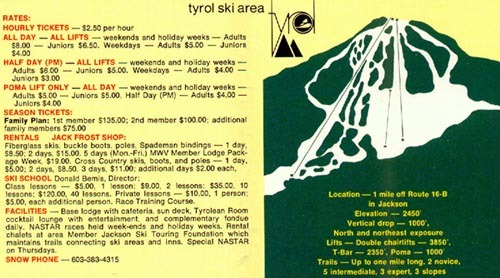 When it opened during the winter of 1967-1968, Tyrol Ski Area was a relative newcomer to the popular skiing region centered around the town of Jackson, NH. Following World War II, Hannes Schneider's ski area at Mt. Cranmore (built in 1938) established itself as the top facility in the Jackson/North Conway region, entertaining thousands of skiers each winter. The oldest mid-size facility in the heart of Jackson was Black Mountain (1935). Like Cranmore but on a smaller scale, Black Mountain remained economically viable by maintaining a strong local following and orienting its outside market appeal towards intermediate level skiers and families. 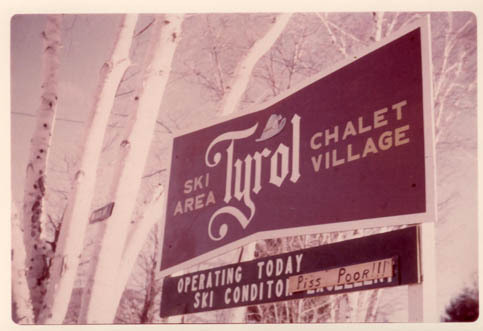 By the time Tyrol opened in 1963-1964, the newer and larger facilities at Wildcat (1957) and Attitash (1965) were gaining in popularity. By appealing to all levels of skiers through a diversity of terrain, vertical drops over 1500 feet and expansive facilities, both resorts became premier destinations among the ski areas in NH's White Mountains. Additionally troublesome to Tyrol's success both were within a short drive of Jackson. While Tyrol had a substantial vertical drop of 1000 feet and a variety of terrain consisting of 4 novice trails, 6 intermediate trails, and 4 expert trails, Tyrol's location proved to be its downfall. According to Tim and John Bailey, former owners and operators, factors such as the area's distance from the highway, and the steep entrance road were detriments that likely led some patrons to favor nearby Black and Cranmore Mountain. Critical to Tyrol's failure was its lack of access to a suitable and stable water supply for snowmaking. Tyrol's lack of snowmaking proved a devastating liability during the 73-74 gas crisis and snow drought, allowing it to open for only a few days. It seems Tyrol's reputation suffered immeasurably during the mid-1970's. An article in Skiing Magazine kindly illustrates Tyrol's plight and demonstrates its desperate attempt to draw skiers with a variety of activities. "Tyrol has the least vertical of any area in the Valley (1000 ft.) but it comes miles ahead in the category of ski area happenings, events, processions, festivals, contests, barbecues, and general madness." Faced with mounting debts Tyrol closed for good following the winter of 1980-1981. The long, 1000 ft vertical double from Tyrol. 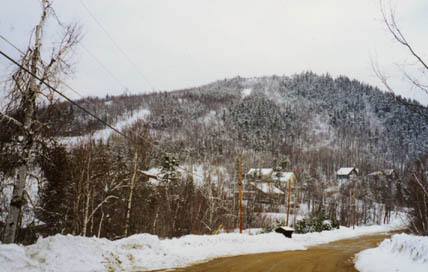 Image courtesy of the New England Ski Museum. Here's information on Tyrol's history, all condensed for easier viewing. To view a Tyrol Guest Check for cafeteria food, click here. This check provided to NELSAP from Dan Houde, who is in charge of visual communications at Attitash. Bob Maguire: During my senior year in college I worked for Tyrol on ski patrol. During the winter of 1970-1971 the patrol was run by Jim Pittman of Lovell, ME. The area was a real estate development project with a ski area. My understanding was that Murray Dearborn developed many lots on Tin Mine Road and its side roads. Tin Mine is at times a steep ascent to a parking lot for the ski area. The area also had a pool and clubhouse for summer swim lessons etc.. The area had three lifts. A short Poma lift, a T-bar to the summit and a double chair on the "back side". The base of the chair was lower than the parking lot. This created a challenge when assisting an injured skier below the parking lot level. The skier was attended to, placed on a toboggan and skied to the base. 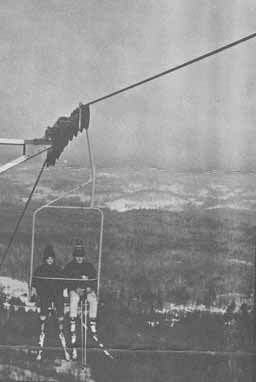 The toboggan was the lifted on to the chair lift and a patrolman rode along to the top. We then off loaded and skied to the first aid building at the parking lot level. There was a small base lodge with a Jack Frost Shop and cafeteria. The bar was in the clubhouse by the pool. Across the parking lot was a maintenance shed. The mountain manager was Uel Gardner of Farmington. Uel and Murray later teamed up to develop Mt. Massanutten in VA. My favorite memory of Tyrol is meeting Annie Wesley. It took some convincing but we have now been married for 26 years. Andy Kramp: "I consider your web-page a wonderful find. I grew up skiing Black Mt. and Tyrol in Jackson, NH and consider Tyrol to be a meridian to the soul of my childhood." Neil Cohen: Here is photo from the late 60's. I was a part time ski patrolman at Black Mountain, and there was a friendly rivalry between the Tyrol and Black patrols. We were always amused that no matter WHAT the ski conditions were at Tyrol, the sign on the road ALWAYS said "Excellent". One early morning in March as we were driving to work at Black, one of Black's patrolmen, who's initials are S.R., nailed a homemade replacement sign over the "permanent" excellent sign. I snapped the picture and nobody has seen it until now, almost 40 years later. Eric Murphy: I am so happy to find your site. I grew up skiing at Tyrol. I was in the kids racing program since the very early seventies. We own a house just down from the area which I used to ski home to for lunch. The saddest day of my life was when I heard the mountain was going to have to close. That last winter, the chair was closed altogether, and all they could run was the poma lift. Up until a few years ago I would always have a dream in the fall that someone had bought the mountain, and reopened it. Bill: I especially enjoyed the information on Tyrol. I skied Tyrol a couple of times in the mid-70's and have fond memories of some great skiing. My memory told me that the parking lot wasn't at the bottom of the hill. However, I couldn't figure that out when I visited the now-defunct ski area in the late 90's. Thanks to Eric's diagram on your site, I could see how it worked. 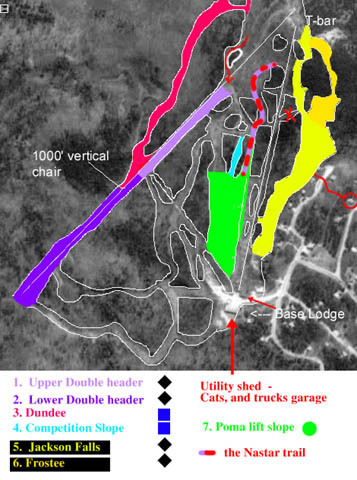 The parking area was near the base lodge (shown in Eric's diagram). We put our skis on and skied through the parking lot to a little narrow chute that dropped off the side of the parking lot and led to one of the areas trails, which led to the bottom of the chairlift on the far left. I made a little diagram with a few trail listings. I am embarrassed at how few trail names I could actually remember when trying to. I also circled our house, with a rough approximation of how we used to ski home. My favorite trail was always Jackson Falls. It was a nice steep bump run on the right side ( when facing the Mt.) that wasn't usually crowded, and was fairly ski-able for a kid. The showpiece trails on Tyrol would have to have been the Double Headers and Frostee. Upper and Lower Double Header ran under the chair, and were both fairly steep, with a flat spot in the middle, and the bottom half usually bump-encrusted. This seemed to be where everyone headed to see and be seen from the chair lift. On more than one occasion I saw someone hit a bump wrong and smack into the poles. Frostee was a little right angle trail to the far right of the mountain, that was steep as hell, always covered with icy bumps, and was so thin, steep, and non navigable, that they could rarely (if ever) get a cat up it. This was the trail on which all your best skiing stories (lies) happened when you were ten years old. The NASTAR Slope varied from the competition slope, to a path starting 80% up the mountain, to the left of the T bar slope, winding down through a sharp s-turn, and finishing on a straight away that paralleled the competition slope. (Whose name I cannot remember.) This spilled out onto the area where the Poma lift left off. Please...the owners of this property have asked us to post that there is to be no trespassing on the former Tyrol ski area. Please respect their wishes and do not walk or hike on any of the property surrounding the mountain. Thanks! This photo is from Feb, 1999. We stopped by the edge of this area on our way back from Black. 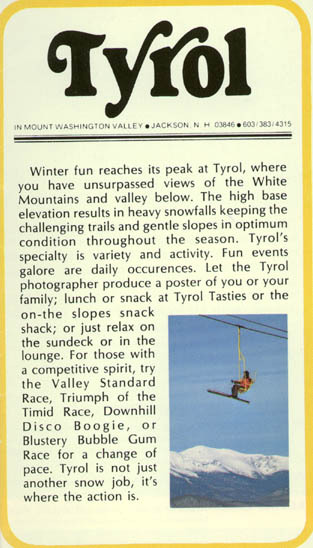 Here's Tyrol as it appeared in February of 1999. Most of the trails are grown in as you can see. The T-bar lift line is barely visible on the far left. The long double chair is not visible.